BIG NEWS GUYS, the world’s biggest waterslide will come back to Auckland!!!!! The first time New Zealanders could go on the mammoth slide was in 2013 in Waimauku. For the 2015 edition, a 600m (!!) inflatable slide was created. Right there it got an official certification as ‘The World’s Longest Waterslide’. It is a great way to spend your afternoon, besides that the slide is an initiative by the charity Live More Awesome (http://www.livemoreawesome.com/) who seek to increase awareness about mental health. The organisation is run Jimi Hunt and Dan Drupsteen, who both have suffered from depression. The money they raise with the waterslide will be used to make a difference to the way New Zealanders perceive mental health. The slide will be at Jonkers Farm from February 12 – 14, 2016. There are around 950 tickets up for sale. If you miss out on the tickets you can work towards one of 200 golden tickets available for the top 200 fundraisers. Besides the awesome big slide, there will also be some performances from a lineup of local musicians, DJs and performers. Throughout the day there are wellness workshops happening. Do you want to ride a 600m inflatable slide down a picturesque West Auckland slope? Hang with awesome people, listen to some funky beats and eat good food? Do you want to see the mental health stigma reduced so people know it’s ok to ask for help? Then go buy a ticket on www.worldsbiggestwaterslide.com and we will see you there!!! This entry was posted in Uncategorized on November 27, 2015 by INTERNeX New Zealand. INTERNeX New Zealand: Cheap Hostels! This entry was posted in Uncategorized on November 21, 2015 by INTERNeX New Zealand. Upcoming event! Farmers Santa Parade! For 81 years now, the Farmers Santa Parade has brought joy to children and adults of Auckland, and this year is no exception. The Auckland Santa Parade features all the amazing pageantry, fun and surprises that have made this annual Auckland city Parade one of the most favourite’s activity of the year. 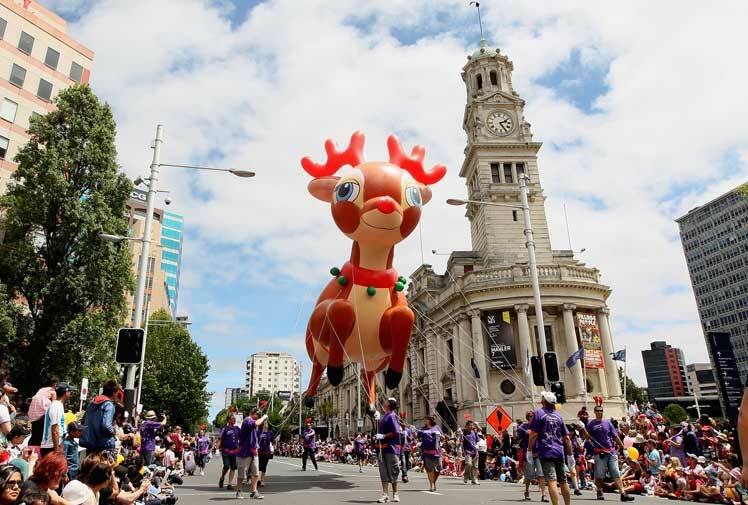 Heralding the start of the Christmas season, this beloved holiday parade features colourful grand floats representing the cultural diversity of today’s Auckland, lively marching brands, amazing character balloons, an appearance by Santa Claus his self plus much, much more! The Farmers Santa Parade starts at 1:00pm, Sunday 29th November. The parade route is long and takes approximately 1 hour to pass any given point. The parade ends at 2.30 pm with Santa´s party from 2:30pm to 5:00pm in Aotea Square. If the weather is torrential, a cancellation will be announced after 10am on Sunday 29th November. If the Parade get cancelled, is the new date Sunday 6th December. The Parade route starts at the corner of Cook Street and Mayoral Drive, turns left into Queen Street, travels down Queen Street and left again into Customs Street West then up Albert Street, ending at Albert and Wellesley Streets. 3:50pm – All Star Cheerleaders performance, be amazed by the 2 x World Champion team NZ Cheerleaders and teams from all-star cheerleaders as they display their amazing, world-beating skills. This entry was posted in Uncategorized on November 14, 2015 by INTERNeX New Zealand. Summer is coming, which means that the festivals are also around the corner. Who doesn’t love a good day out, with live music, some good drinks, a few friends and an amazing day?! Or a day where you can explore some amazing new things. I will write down some of the amazing festivals that will be held in New Zealand in the upcoming months. Check it out and make some memories!! Over 45 gardens in the Rotorua region will be opened to the public in this weekend. The festival is held every 2 years and this year there are many gardens that are new to the festival, but there are also some old favourites! The Rotorua Festival of Gardens is a self-guided garden ramble where you can choose which of the gardens you want to visit. Many of the gardens will also have items for sale, like plants, food or artworks. Take a step back in time and sample the nostalgia of the Victorian era right in the heart of Oamaru’s Victorian Precinct. Musicians, singers and dancers from around the world will be performing. On this day you will be amazed by the Victorian costumes and an Alice in Wonderland costume parade will take you right into the world of Alice. Ryhtym and Alps is a two-day music festival on the South Island. The festival is located in the beautiful Cardrona Valley which is about 15 minutes south of Wanaka in Central Otago. Rhythm and Alps is a spectacularly event with an amazing scenery. STICKY FINGERS, a hypnotic melting pot of psych, rock, reggae, & bourbon. Rhythm and Vines is a three-day New Year Music Festival and is set in the beautiful Waiohika Estate vineyard of Gisborne. This festivals shows the world’s best musicians and receives more than 30.000 local and international fans who travel to experience the first sunrise of the year at New Zealand’s biggest music festival. Each year Pukekura Park, one of New Zealand’s premier botanical gardens, is transformed into a beautiful illuminated night-time wonderland with multi-coloured lights gleaming amongst the trees, attracting over 100,000 visitors each year. The festival also includes popular performance features, lighting features, (over 1,000 lights installed) a fantastic mix of daytime activities for children and families, twilight movies in the park and live night-time entertainment from a range of local and national performers. Wellington will host the New Zealand International Arts Festival, with 300 dynamic, different acts over 24 days. The event turns Wellington into a lively festival city where you can live and breathe every imaginable visual and performing art. Music, theatre, dance, visual arts, literature and even art talks and tours, make it to New Zealand’s largest multi-arts festival and it will probably one of the most unique events you will see. If these festivals don’t speak to you, no worries.. There are a million of other festivals going on. Go to this (http://www.newzealand.com/int/events/) website and find exactly what you love to do/see and have a great day. Enjoy and if you’re going, I’m curious about some amazing pictures so I will be checking the mail!! This entry was posted in Uncategorized on November 7, 2015 by INTERNeX New Zealand. We made a new event calender for November!! Check it out and go do some awesome things while you’re staying here in New Zealand!! This entry was posted in Uncategorized on November 3, 2015 by INTERNeX New Zealand.